He began his career as a teacher himself. In the 60’s Holt worked to reform the public school system to better suit the interests of students. Early in the 70’s he realized public schools were not going to be reformed without a greater shift in society at large. He then became a tireless, passionate advocate for homeschooling. Holt wrote eleven books on the public school system, homeschooling, and learning. He founded the magazine Growing Without Schooling. 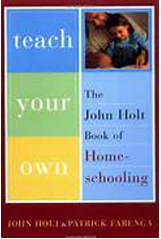 The book Teach Your Own, the John Holt Book of Homeschooling thoroughly informs the reader on the benefits of homeschooling and refutes the stereotypical arguments against homeschooling. It offers the reader insights into why and how children learn [covered in more detail in How Children Learn] and touches on the myriad ways public schools are failing our nations youth [covered in greater detail in How Children Fail]. Above all, John Holt cared for, appreciated, and respected children in a manner that has all but vanished from our culture today and this is what really shines through in all his writing. My only critique might be that he lacks the parental perspective. As far as I can tell, he didn’t have children of his own, but spent much time observing and learning about his students and his friend’s kids. As parents, we seek understanding for the challenges we face raising our children and homeschooling them, if we make that choice. Of course, there are great homeschooling books written by parents, like Alison McKee’s book which I reviewed a couple weeks ago on this blog. What is best about John Holt’s perspective is his pure faith in the ability of all children and his words both reassure and inspire us all to do our very best.